Simple salient region detection and identification using keypoint matching. This module finds objects by matching keypoint descriptors between a current set of salient regions and a set of training images. and match descriptors from current image to training image descriptors. Here, we alternate between computing keypoints and descriptors on one frame (or more, depending on how slow that gets), and doing the matching on the next frame. This module also provides an example of letting some computation happen even after we exit the process() function. Here, we keep detecting keypoints and computing descriptors even outside process(). Also see the ObjectDetect module for a related algorithm (without attention). Simply add images of the objects you want to detect into JEVOIS:/modules/JeVois/SaliencySURF/images/ on your JeVois microSD card. Those will be processed when the module starts. The names of recognized objects returned by this module are simply the file names of the pictures you have added in that directory. No additional training procedure is needed. Beware that the more images you add, the slower the algorithm will run, and the higher your chances of confusions among several of your objects. Definition at line 105 of file SaliencySURF.C. Definition at line 111 of file SaliencySURF.C. Definition at line 120 of file SaliencySURF.C. Definition at line 126 of file SaliencySURF.C. Definition at line 137 of file SaliencySURF.C. References jevois::BoundedBuffer< T, WhenFull, WhenEmpty >::filled_size(), LERROR, LINFO, jevois::BoundedBuffer< T, WhenFull, WhenEmpty >::push(), system(), and jevois::warnAndIgnoreException(). Definition at line 152 of file SaliencySURF.C. 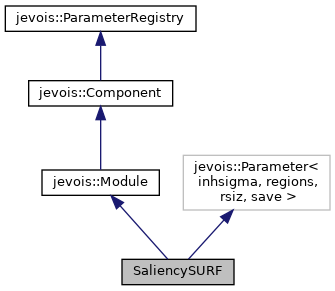 References jevois::rawimage::convertToCvGray(), jevois::rawimage::drawFilledRect(), jevois::rawimage::drawRect(), jevois::RawImage::fmt, jevois::RawImage::height, JEVOIS_REGISTER_MODULE(), LERROR, LINFO, jevois::rawimage::paste(), PATHPREFIX, jevois::BoundedBuffer< T, WhenFull, WhenEmpty >::pop(), jevois::BoundedBuffer< T, WhenFull, WhenEmpty >::push(), jevois::RawImage::require(), jevois::Timer::start(), jevois::Timer::stop(), system(), to_string(), jevois::RawImage::width, and jevois::rawimage::writeText().